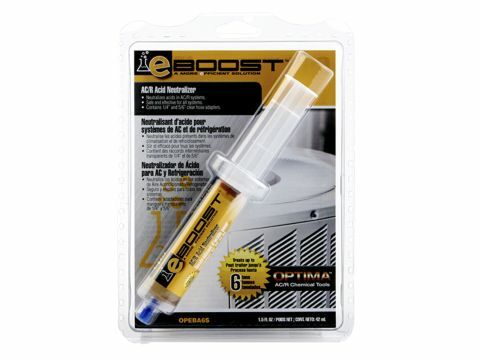 OPEB6S | AC/R Performance Enhancer - CPS Products Inc.
eBOOST™ AC/R Performance Enhancer is a professional grade chemical tool that contains concentrated synthetic catalysts and high quality lubricating agents to allow AC/R systems to operate at maximum efficiency. eBOOST™ AC/R Performance Enhancer also enables refrigerants to evaporate at lower temperatures, which allows systems to draw more heat from the air. This lowers the coil temperature which delivers colder vent air. Also, the added lubricating agents increase compressor oil effectiveness, which reduces friction and allows compressors to run cooler, quieter, longer. Turn AC/R system on and set to lowest temperature. Hold syringe end upright and unscrew (remove) blue cap. Select a ¼” hose (black o –ring) or 5/16” hose (green o-ring). Attach threaded end of hose to syringe. Gently push plunger and fill clear hose with solution (to displace all air from hose). Connect hose to system low pressure service port and inject 100% of solution. Disconnect hose/syringe from system and discard. Continue to run system for 30 minutes.